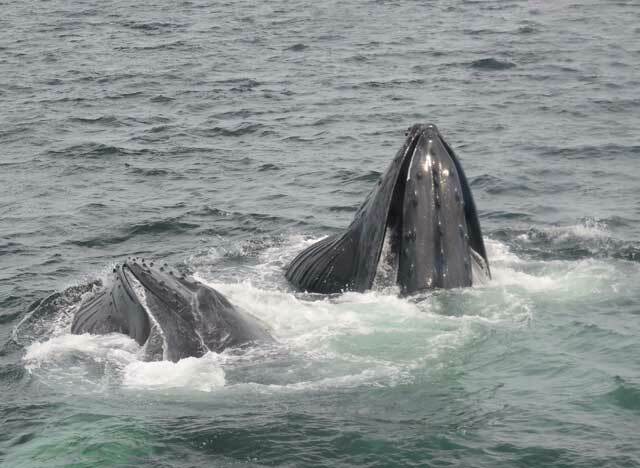 This morning on the Asteria we headed out to the northwest corner of Stellwagen Bank, where we spent time with two humpbacks, Shuffleboard and Satula. We started out getting looks at Shuffleboard, who was feeding under the surface. After a bit she decided to head a different direction and Satula decided to head in our direction, so we finished up getting some nice looks at his tail. On the afternoon trip aboard the Cetacea we headed out to the same area, where the activity had heated up a little. We spent most of our time with Shuffleboard again, as well as female humpback Venom. Venom is an easily identified whale as she is missing part of her right fluke. These two whales started to feed more actively using bubble clouds, and even joined together twice two come up through the bubble cloud with open mouths! Other whales that were in the area were Satula and Boomerang. See what happened on today's noon trip!